"It's tough out there. All of us working in Morecambe and Lancaster know just how tough our current environment is. 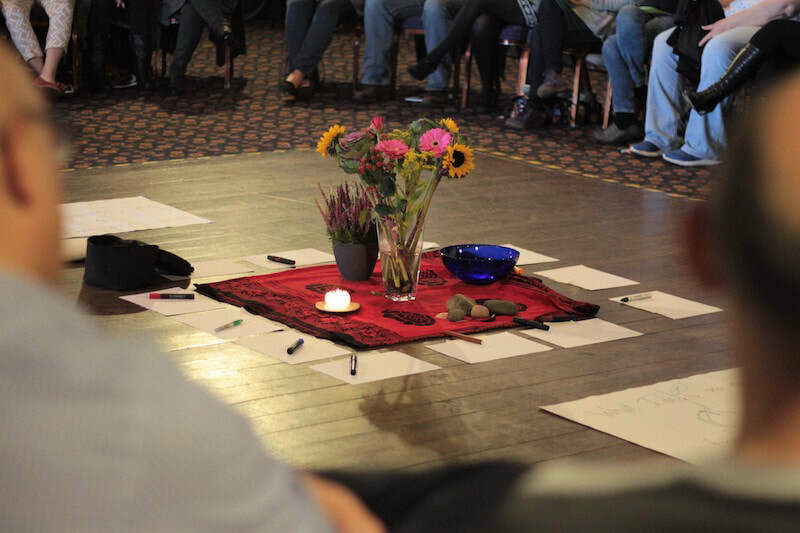 Yet there are some new shoots growing, new ways of being and working together and that's what we have come here to cultivate"
So began the 2nd Art of Hosting Training in Morecambe and Lancaster in October 2017. "it's time to step off the roller coaster and find others willing to step into the rough track with you and carve out another furrow. It's only the start of this journey of HEALTH AND WELLBEING IN MORECAMBE AND LANCASTER. We don't yet know the what or the how of this growing social movement, but we do know this is a beautiful place to be and there are some wonderful people here ready to bring in the changes we need in our towns and across the Bay." 45 new participants came together to train in the Art of Hosting, and Harvesting conversations that matter. To build community, strengthen relationships, and break the loneliness that can stop us moving forward.
" The world doesnt need more experts, it needs more good people. What will your footprints and fingerprints leave behind"
Check in: What do you care about that brings you here today ? 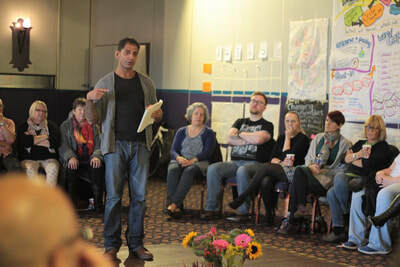 We used circle practice to hear everyones voices and realised we were a very diverse group of people. Some worked in substance misuse, some were ex drug users. Some worked in schools or with children and young people, others in the police force. Some worked with communities, some were residents from different communities. 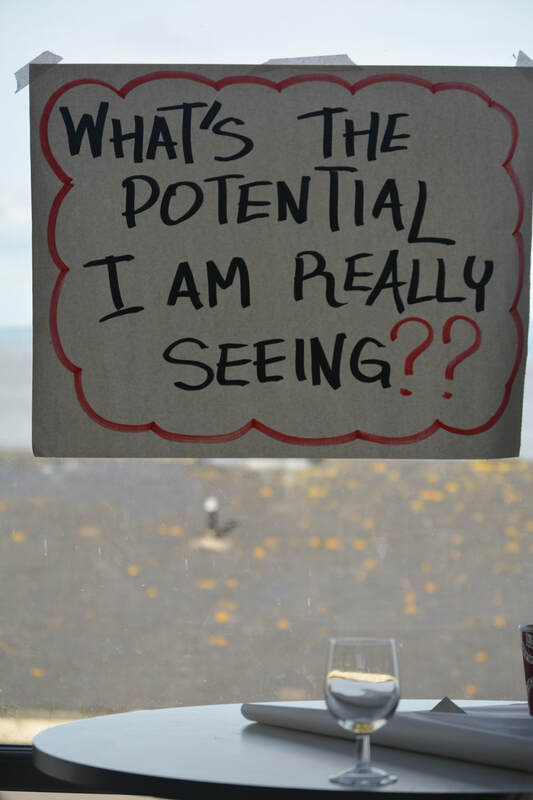 World Cafe: Our first conversation was about the potential we were seeing in Morecambe for a more humane, more connected, healthier community. We saw the potential of developing alternative communities, who often have their own solutions but we need a new way of listening to them. We recognised there are so many good people here who want Morecambe to succeed. We acknowledged our amazing resources and natural beauty and discussed the possibility to change the way we fund and measure projects by changing the power dynamics. ​Jon took us through some basics on harvesting, making sense of and working with the results and data that comes out of conversations and invited some of us to get some practice in harvesting in this training space. He talked about the purpose of harvesting and how to plan for it. How to collect and make sense of all the visible reports, photos, records, suggestions, ideas, as well as how to capture some of the more invisible things that happen in community conversations like building communities and developing community confidence. Following a delicious lunch provided by Stanley's, we went into a teaching from Linda contrasting two worldviews: the mechanistic system and the living system, a model for thinking about how we operate and what we pay attention to. What would our meetings be like if we moved from instructing to hosting, from looking for answers to finding really good questions, from jumping into action to creating conditions for good things to emerge? This was followed by a conversation that invited people to stand on a spectrum ( a line ) to show the diversity of views that existed in the room in response to some simple questions. We were playing with the idea of "how do you put yourself in another's shoes"? How do we begin to see the world from other perspectives, often from perspectives we don't agree with? We closed our first day together by asking - what are you taking away from today?